Fresh foods can give you the energy that you need to get through the day. They can also bring you happiness with the delicious taste or satisfaction when you’ve completed a meal. In 2018, there are probably some resolutions that you want to try out. For instance, you’re probably focusing on losing weight and getting healthy. 32 percent of people who make resolutions are practicing those two things. Eating healthy can be difficult when you aren’t sure how to start. In today’s blog, we’ll be helping you take those small steps toward eating healthy in 2018. 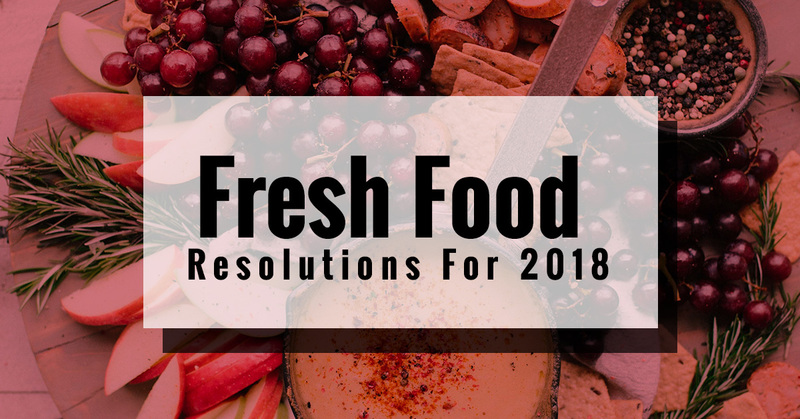 These resolutions will introduce you to some new and innovative ways to get healthy while enjoying the fresh food you’re eating. If you’re ready to eat healthy this year, then check out some of our weekly and weekend specials. Resolutions are important because it can help you make a change in your lifestyle. If you want to start getting healthy, then eating fresh foods is a great place to start. To help you get on track for a healthier 2018, we compiled three resolutions you should try this year. From giving up on the diet mentality to trying new types of food, we have you covered when it comes to trying a new way to be healthy this year. For more information on getting healthy in 2018, read Suggestions To Eat Healthier In The New Year. The first way you can incorporate a New Year’s resolution into your everyday life is by buying new types of food when you go to the grocery store. When you make your list, try to choose something that you wouldn’t normally choose or a vegetable that you’ve always wanted to cook with, but you’ve never tried. Choosing different foods will allow you to be a little more creative and get out of the rut you’re probably in. Pick up anything from a new protein to a different type of flour each week and allow you cooking skills and palet to grow. When you allow yourself to get too hungry, then you’ll eat anything. You’ll grab whatever you can find and end up overeating because you’re starving. Everyone has done it, but you should take the time to eliminate doing it from your daily life. If you know that you get hungry around noon, then schedule a meal around then. If you slow down and allow yourself to take in what you’re eating, then you’ll avoid gaining weight and actually enjoy what you’re putting into your mouth. Diets are very popular in our society, but it’s time for you to give up the diet mentality plus the rules and regulations that go with them. Diets can be helpful when you are trying to restrict what you put into your body, but if you want to make a real change in what you put into your body, then it’s time to start living a healthy lifestyle instead of following diet-based beliefs. The official diet mentality, rules, regulations, and judgments will harm the way that people view their bodies and will cause you to even gain weight. By trusting your body and learning about healthy eating, you’ll be able to eat better and feel healthier. Joseph’s Classic Market is located in Boca Raton and Palm Beach. We are open all week and even offer ordering online options to cut down on the time you have to spend running errands. We look forward to helping you eat healthier in 2018.